Volunteer at our Sea Turtle Conservation Beach ProjectsYou can help us protect the nesting sea turtles on the Pacific Coast of Costa Rica! 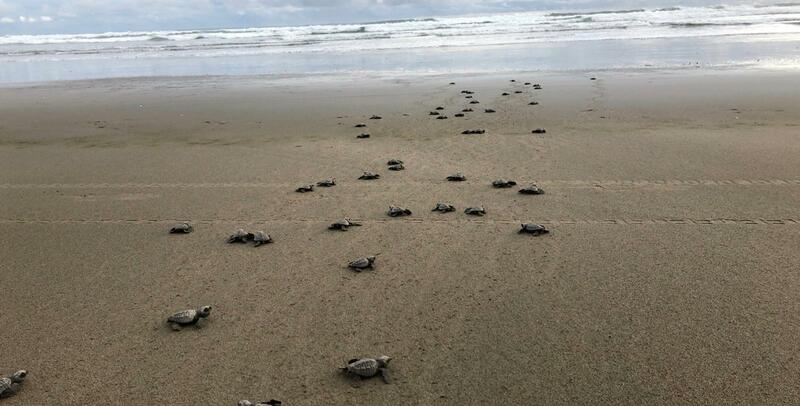 Turtle Trax S.A is a limited company contracted by CREMA to manage all International and National volunteers who wish to work alongside CREMA on one of their four nesting beaches, protecting marine turtles of the Pacific Coast of Costa Rica. Over the last 12 years, volunteers have protected thousands of sea turtle nests and released hundreds of thousands of hatchlings back into the Pacific Ocean. Volunteers not only work with sea turtles, but with the funds generated through these programes help provide an income for local community members and serve sustain CREMA’s various sea turtle conservation projects along the Pacific Coast of Costa Rica. As a future volunteer, your contributions will also build a sense of awareness among the local population regarding the importance and benefits that come from protecting these animals—the true definition of sustainable tourism. Participants become immersed in the conservation project and the local culture, and speaking Spanish, while helpful, is certainly not a necessity (though you’ll have plenty of opportunity to practice!). Our goal is to help locals to take advantage of all natural resources the area is offering, obviously, in a sustainable and friendly way, taking care of the mother nature.